Perhaps the most popular use for BlackBerry devices is business. Even business users need to stock up on supplied to get the most from their device. From charging to cases to applications, everyone needs a little something extra. Check out this guide to find out just what to buy for the BlackBerry business user in your life. Want to keep your device charged and be ready for those on the go lunch meetings? Then the BlackBerry Charging POD is for any business user in or out of the office. 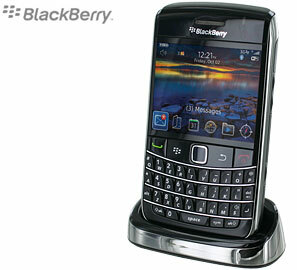 The BlackBerry charging POD is available to accept models from the 8100 series to the 9700 Bold series. This Charger will allow the device to be always charged and ready at a moment's notice. With the overall chrome finish that will accent any office environment, this charging system not only adds simple functionality but class!!! With features like using OS 5.0 clock (Bedside Mode w/ Alarm) you will never miss an appointment again. Use the BlackBerry Native OS media player and Jam out to some tunes in the office. Keep one on your desk, and the other by your bedside at home. They're tidier-looking than simply laying the BlackBerry on the desk, and they keep it out of harm's way in case you happen to spill your coffee! In order for the charging pod to work you will need the BlackBerry USB cable or wall charger that comes with your device. Simply insert the USB cable into the back of the charging pod and you'll see an indicator light come on. This means your BlackBerry is now ready to be charged. Drop the device in let it charge away!!! It's that simple!! Display, sync, and recharge your BlackBerry Storm in the office or at home with the help of the BlackBerry Storm desktop Charging Pod. Conveniently position the handheld for speakerphone calls with clients, or listening to relaxing music in the office while looking over a proposal. Always be charged up and synced for those that are on the go. Keeping a log of appointments and contact info update to date in the corporate world these days is very important. Don't let the embarrassment of not having a charged up phone, or not being able to contact an important office official. Be charged and ready with the BlackBerry Charging Pod! Let's face it, one of the worst sounds a BlackBerry user can hear is the one made when their phone slips and makes contact with a hard surface. Then there a scratches, dings and all manners of things that the phone needs to be protected from. With that in mind every business user should have at least one good case. Because cases run the gamut from simple to stylish to the fortress like protection of the OtterBox series, we will take a look at one standout from each category. Simple: It does not get simpler than the case normally included with the phone. It provides and adequate amount of protection, has a sleeper magnet to put the device into standby, and is slim enough to be pocket-able. 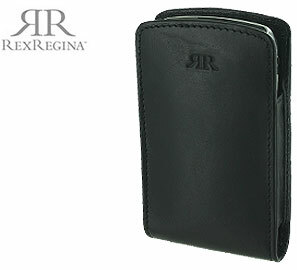 Upscale: There are quite a few upscale cases out there and the folks at RexRegina have one of the best: The Morgan Case. This case has very clean line, a classy look and covers more of the phone surface than the OEM case above. The use of exotic materials puts it in a class all by itself. The one knock is that like the simple case above you have to remove the phone from the case to do anything. Snap on case: One of the best in this category is the Seidio Innocase II. Coming in at 1mm thick this is one of the lightest and thinnest cases available. It is also one of the strongest. The case is a hard plastic finished with a very smooth rubberized covering. It adds almost no bulk to whatever phone it is on and has the appropriate cut-outs for all of the phones functions (except the charging port). Very well made and not very expensive. This case is a winner. OtterBox Defender Series: I carry my BlackBerry around with me all day, and when I purchased my new BlackBerry Tour last July I became paranoid about dropping it (in the water, in the sand, on the concrete), banging it into something, spilling on it, scratching it, and other horrible things. I decided I needed a protective case, and after some searching I settled on the Defender Series from OtterBox. This has turned out to be the best investment I could have made for my device. Having an Office job and also going on emergency calls I needed protection at a moment's notice. But those business users that are not in the office at all times need protection. Whether it is a job site you are over seeing or a ground breaking construction job, the OtterBox has you covered. With 3 layers of protection the defender series will make sure your device never suffers a ding or a crunch that we all fear to hear when getting out of the car and dropping the phone on the pavement. With the Defender Series, you pick it up and keep going. With access to all ports and keys, getting the message out to those personnel on your team is a breeze just with added protection and peace of mind knowing your device has the best protection at all times. We all love the BlackBerry because it affords us the ability to communicate via various means effortlessly and on the go. There are times however when typing on a tiny keyboard is not an entertaining proposition. 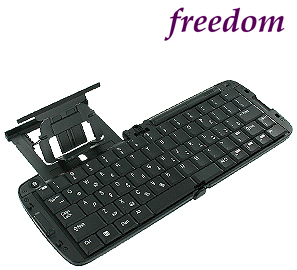 Well, the Freedom BT Keyboard has you covered. This keyboard weighs in at less than 8 ounces (including batteries), features 65 full sized keys on 5 rows, and folds in half making it very portable. Setting the keyboard up is quite simple and even though powered by 2 AA batteries it will provide a lot of use on one set. Whether you are in the BBM conversation that never ends, have to bang out a lengthy email or just want to use your BlackBerry somewhat more comfortably, this is a very good business user accessory. One of the most important accessories for business users (well, most users actually) is a good Bluetooth headset and the MotoPure H12 fits the bill. It is light, elegant stylish and has amazing call quality thanks to CrystalTalk 2-microphone system that does an excellent job at noise cancelling. Contained in the package is the headset, a desktop charger and a case that doubles as a charger, 3 pairs of earbuds, and a wall charger. 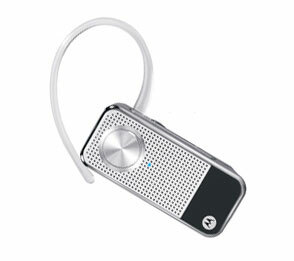 Design: The headset is very small, light and minimalistic. The front is a combination glossy black plastic and perforated metal. This gives it a classy, visually appealing look There is a large multi-function button on the front, volume rocker on the right side and an on / off switch on the top. The included earloop is clear and very comfortable to wear, even for extended periods of time. There are also 3 earbuds to help with getting the best fit possible. Charging: The case and the desktop charger have magnetic contacts making quick and easy to set the headset down for charging. The case also has a battery level indicator. Pairing: Pairing the headset could not be any simpler. The first time you turn the unit on it goes straight into pairing mode from there the rest of the process is routine. Call quality: Call quality with the unit is very impressive. Even in the loudest environments or when driving with the window down and music playing, no one has any trouble hearing me and on my end they come in very clear. Battery life: Battery life is pretty much on par with the majority of units on the market. While not an accessory per se, eMobile Email should be in every business users arsenal. What this application does is patch a few holes in the native email reader. With this application you can create email-able templates for things you send often, add events to the calendar or to the task list, sort your email by sender, subject or date, view your mail in list view or list with preview, and my favorite feature is the ability to create folders. This is the Swiss Army Knife of email viewers and well worth the cost for what it delivers. One downside to this app is there is currently no way to open attachments from within it. The developers are working on that issue.